If you live in Edinburgh, and Edinburgh is in Scotland, then you live in Scotland. This reasoning draws on the containment metaphor, and the transitivity of containment. It is easy to represent as a diagram, eg, as a Venn diagram. If something is in A then it is also in B. All As are B; C is an A; therefore C is a B.
C.S. 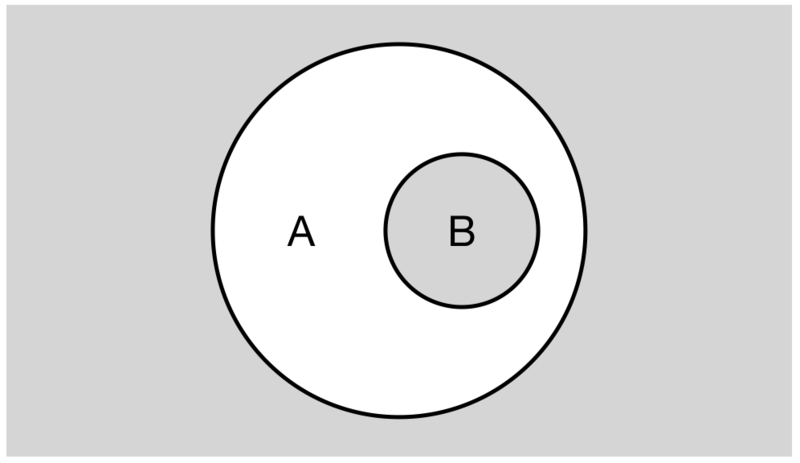 Peirce worked with Venn diagrams (such as the one above) and even developed a means of extending their scope to include variables. But he also developed his own system of logical diagrams that look superficially like Venn diagrams. Because I am so wedded to the idea that nested shapes indicate containment, I find it difficult to interpret enclosing shapes to be read in any other way. But in his existential graph system, Peirce’s enclosing shapes indicate exclusion. Peirce proposed a method for representing logical propositions diagrammatically, and in such a way that you can transform that diagram (through a series of rules) to demonstrate a logical proof. Instead of thinking of bounding lines (the circles in the Venn diagram) as including what is in them, think of the lines as demarcating exclusion, i.e. as “untruths,” or more precisely, propositions that are not the case in the domain of discussion. The diagram above reads not(A and not B). This is Boolean terminology familiar to anyone who has searched a database using the standard query language (SQL). Substitute Edinburgh for A and Scotland for B. Then the diagram reads: you can’t live in Edinburgh and not live in Scotland. It is equivalent to saying that living in Edinburgh implies you live in Scotland — A implies B.
Peirce also devised a series of rules to operate on such diagrams to convert one set of propositions into another. 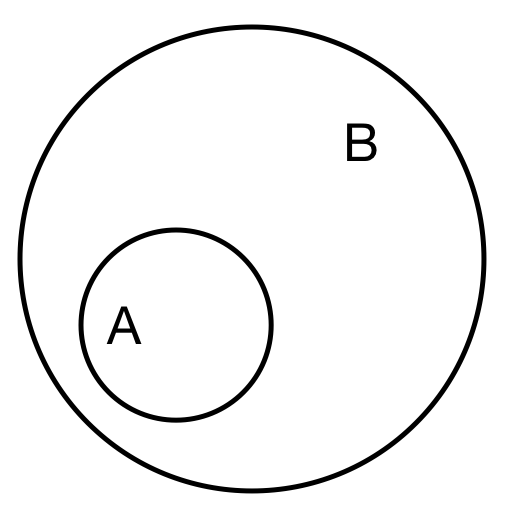 The diagram below demonstrates the working of the syllogism: A implies B, A, therefore B. I have left out the transformations demonstrating how the final proposition it derived. But here is the starting diagram and what it looks like at the end of the demonstration (proof). The 5 rules Peirce devised for translating a diagram so as to demonstrate a proof include removing double cuts, i.e. not(not(A)) is simplified to A. There’s no need to iterate these rules here, and I think they are similar to basic Boolean calculus, but in graphical form. How does this diagrammatic method cope with abduction, i.e. the proposition that if someone lives in Scotland then there’s the possibility that they live in Edinburgh, but no logical certainty that they do? does not hold according to the transformation rules. Such speculative propositions that someone might live in Edinburgh if we know they live in Scotland are supported by Peirce’s gamma graphs and the idea of the “broken cut” (a dashed boundary) meaning the “possibility of,” requiring 2 extra rules to process. The start and end points of the demonstration (proof) would look like this. Proving that something is a possibility is easy, and the method supports such a demonstration. But to ascertain how likely it is requires extra evidence, as well as some extra-logical processing. See post Calculating belief. Dau, Frithjof. 2006. The Role of Existential Graphs in Peirce’s Philosophy. Available online: https://pdfs.semanticscholar.org/a177/1dfa8ed242a0fa19df149d2353dd24ae77f6.pdf (accessed 25 January 2018). Sowa, John F. 2011. Peirce’s tutorial on existential graphs. Semiotica vol 186, issue 1-4, pp 345-394. Available online: http://www.jfsowa.com/pubs/egtut.pdf (accessed 25 January 2018). Venn diagrams make for very iconic representations of their universes of discourse. That is one of the main sources of their intuitive utility and also the main source of their logical limitations — they begin to exceed our human capacity for visualization once we climb to 4 or 5 circles (Boolean variables) or so. Peirce’s logical graphs at the Alpha level (propositional calculus) are somewhat iconic but far less so than Venn diagrams. They are more properly regarded as symbolic representations, in a way that exceeds the logical capacities of icons. That is the source of their considerably greater power as a symbolic calculus. Great. Thanks. I’ll look into it.